European mobile penetration rate of 84 percent. But he does predict there will be some reduced usage and spending. Purchases of more advanced handsets and services also might dip. Mobile providers are responding to the anticipated changes by de-emphasizing mobile data services and expanding the variety of SIM-only offers. At least some Gmail Chat users now can send text messages to buddies on their mobile phones using Gmail Chat. Recipients also can respond to those text messages just like they would respond to messages sent directly from a mobile phone, as well. As is typical for new feature introductions, the feature is being rolled out in phases, so not every Google Chat user has access to the feature right now. 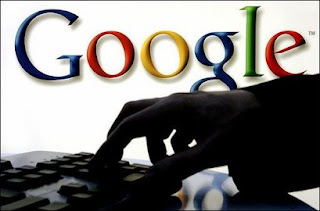 Google appears to enable that function by providing a virtual phone number. The feature also works for mobiles responding from outside the United States, but the operation isn't quite so automated. The ability to send a text message from a PC is not new. The ability to receive text message replies to a PC is. To send text messages, users enter a contact name in the "Search or invite friends" box in "Chat," and select "Send SMS" from the box of options. If a chat window already is open for that contact, users just click "Video & more," and select "Send SMS." If your contact replies, the text message response will appear as a reply in "Chat." These conversations are stored in your Chat history just like regular chats. Just to confirm what you already know, a new study by ABI Research shows that, when it comes to viewing TV and video, growth in consumer markets is more limited by consumers’ ability to create new habits than by technology availability or ease of use. Still, there are some new changes. Game console penetration in the 18-to-25 year old segment showed no gain over last year, whereas penetration in the 65-or-over segment grew more than 200 percent. DVR ownership likewise is up uniformly across all age groups. On the other hand, some 65 percent of the respondents over 65 have never used VOD, compared to 30 percent of those in the 25 to 29 age range. However, 40 to 50 percent of those who have tried it continue use it at least once a month regardless of age. 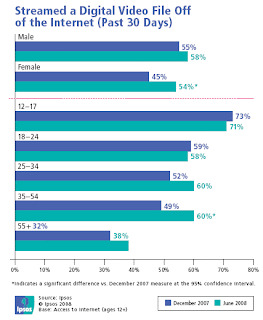 Internet downloading likewise is only really popular with consumers under 30. Video cell phone usage: consumers in their 30s are four times more likely to have watched video on their handset than those in their 50s. The wealthy, willing to pay the extra costs, are much more likely to watch video on their handsets than the less affluent. In some ways, the big story out of Cincinnati Bell in the third quarter was the progress the independent local exchange carrier has had in diversifying its revenue streams. In the third quarter of 2008, just 14 percent of its revenue was generated by consumer voice. About 20 percent of the carrier's revenue was earned providing technology solutions including data center and managed services. Wireless service revenue in the quarter was $74 million, up $6 million or nine percent from a year ago. Cincinnati Bell had 567,000 wireless customers at the end of the quarter, which reflected year-over-year growth of six percent in its post-paid wireless customer base. Post-paid quarterly average revenue per user was $48.82, an increase of $1.41 year-over-year and $1.46 sequentially. Pre-paid ARPU was $26.33, up 15 percent from the third quarter of 2007 while prepaid subscribers declined eight percent. Technology Solutions quarterly revenue was $73 million, down $1 million, or one percent from a year ago. Technology Solutions segment operating income of $6 million was up two percent from the prior year quarter. Data center and managed services revenue was up 39 percent from the third quarter of 2007. But lower-margin equipment revenue declined $10 million or 19 percent from the prior year. Year-over-year DSL subscriber growth was six percent. At the end of the quarter, Cincinnati Bell had a total of 231,000 DSL subscribers. Quarterly wireline revenue was $201 million, down $1 million or one percent from the third quarter of 2007. 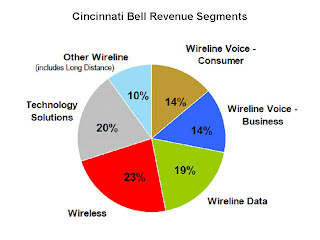 Increased revenue from data services, long distance and expansion markets partially offset lower voice revenue in Cincinnati Bell's traditional service area. Year-over-year total access line loss in the third quarter was 6.8 percent, reflecting a decline in the company's in-territory consumer access lines. Business lines were even with a year ago while expansion market access lines increased 14 percent. The trend can't be identified with any precision yet, but some end users might be adopting a new form of "substitutional" behavior of the sort mobility seems to be causing to wired phone lines. Since June 2008 3G iPhone use rose 48 percent among those earning between $25,000 and $50,000 per year and by 46 percent among those earning between $25,000 and $75,000. These growth rates are three times that of those earning more than $100,000 per year, the original "early adopter" population. The reason it is not clear whether a new trend is emerging or not is that some of these users, perhaps most, are buying $200 subsidized phones, which puts the devices into a range many might be able and willing to pay for some other sort of smart phone. And while the cost of a stand-alone, single-device and single-user account might be fairly hefty for users in the fast-growing income ranges, it is conceivable that many are on family or group plans of some sort that do not represent new monthly charges as much as $70 a month. Still, there is a suggestion here that some users might be choosing to use use a single device for a music player, email device, voice and Internet access platform, possibly cannibalizing some amount of broadband access and wireline voice service in the process. Over 54 percent of those surveyed said their mobile phone usage had increased by more than 25 percent over the last two years, and one in five respondents said it had increased by more than 50 percent, says Azuki Systems, Inc.
About 62 percent of respondents say they either own or will own a smart phone in the next 12 months. ABI Research has revised its expectations for fourth quarter 2008 mobile handset sales to 7.5 percent growth from the 10.4 percent it earlier expected. Call that the expected impact of tougher economic conditions. Year over year annual growth is therefore likely to be between 10.5 percent and 11 percent, to close out the year at around 1.27 billion. Handset sales grew 8.2 percent during the third quarter, year over year. Expect to see aggressive marketing and promotional activities from operators and vendors alike as they strive to lure end-users to upgrade their handsets before the year’s end, ABI predicts. France Telecom has grown subscriber take-up by 72 percent over the last 12 months As of September 30, 2008 the Orange-branded service had 1.746 million subscribers compared with 1.017 million just 12 months earlier. 211,000 customers were signed in the third quarter of 2008. Stats like that are one reason executives at Comcast see AT&T and Verizon as their primary competitors. The Commerce Department has released its preliminary estimate of U.S. third quarter gross domestic product, showing a decline to -0.3 percent. If the fourth quarter follows suit, we will be safe in saying we officially have entered a recession. Consumer spending fell by -3.1 percent. Business investment fell by -1.0 percent, final sales were down by -0.8 percent. Disposable income came in at -8.7 percent. The odd thing is that despite the generally-tough tone since perhaps the summer of 2007, growth has been positive through the second quarter of 2008. Hulu, the online video site, finds that when it comes to advertising, less is more. In contrast to the multiple-ad format used by broadcast TV, only one ad is shown during each segment break on Hulu. In a customer survey commissioned by Hulu and conducted in July and August, 76 percent of nearly 18,000 respondents said that the site had the right amount of ads given the "no incremental cost to view" format, according to the New York Times. Just over 17 percent said there was less advertising than they expected. The survey also found a 22 percent increase in advertiser message association and a 28 percent increase in intent to purchase among users. There might be some "novelty" element driving the findings, so everyone will have to wait and see whether ad effectiveness of this sort continues, on Hulu and other sites that may choose the same format. Only one finding remains consistently true: consumers tend to say they "hate ads." They also prefer getting free content and will tolerate ads if that is the price of getting the content at no additional charge. Hulu has another advantage, however. The ads are short, and there is no way to zip past them, as would be the case if viewing on a digital video recorder. Between now and 2013, a time when global communications service provider revenue will climb from $2 trillion to about $3 trillion, wireless is going to be a key factor. Whatever else happens, mobility services in developing regions are going to play a big part in that growth. In developed regions, pressure on landline voice revenues will be the challenge. In developed regions, service providers will have to create new services based on wireless and broadband, especially services that combine formerly-separate experiences such as voice, image, video, audio, text, presence, location independence and devices. Nothing is certain, in that regard. History suggests that service providers, even those deemed to the most slow-moving, can replace their revenue mainstays. Wired telephone services providers, generally considered the slowest-moving contestants, already have twice done so. They made a transition from "dial tone" to "long distance" as the revenue mainstay. Then they made a transition from "long distance to wireless." The next transition will be to replace wireless, as inconceivable that might seem. IP services are part of the answer. Video and content are parts of the answer. Software and information technology services are part of the answer. Personal broadband is part of the answer. It remains unclear whether, in the next iteration of industry business models, there will be a single revenue source that clearly underpins all the others, even though this has been the classic model. The only thing that is clear is that, as important as wireless is, it also will someday fade as the key industry revenue driver. 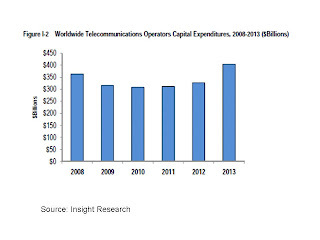 Global telecom capital spending will decline in 2009,compared to 2008 levels, say researchers at Insight Research. Spending will accelerate in 2011, driven in part by wireless and broadband spending in developing regions such as India and China, Insight Research predicts. Between 2008 and 2013, those investments will drive global revenue from the current $2 trillion level to more than $3 trillion, the company projects. New research from Parks Associates indicates high-tech amenities like broadband, security, and energy controls positively influence the sale and rental of multifamily properties. Researchers found nearly 50 percent of multiple-dwelling unit developers are seeking new electronic products and services that will differentiate their properties in an increasingly competitive market. In particular, in-unit broadband service is becoming a “must-have” feature, with 60 percent of multi-family units offering some form of high-speed Internet. Security systems and monitoring services, electronic locks, and energy/utility management systems are also becoming more common in order to increase the speed of sale or rental of an MDU property. Wireless analyst Chetan Sharma sees no sign yet of any weakening of mobile data revenues from the AT&T and Verizon wireless reporting of the third quarter. Since the fourth quarter is seasonally strong, we might not see any slowdown in the fourth quarter, either, he suggests. In all likelihood, we'll have to wait for first-quarter 2009 results to see whether economic stringency has negatively affected mobile data. Personally, I would bet against a dip. Where is Telco Capex Going? As global carriers are in the midst of capital planning exercises for 2009, one key question their suppliers must grapple with is what changes might be forthcoming. Analysts at ABI Research perhaps optimistically think global carrier capex will dip just about 1.3 percent from 2008 levels, when capex grew a bit more about eight percent. Ovum believes the most likely scenario is a generally mild impact on the telecoms industry, with growth and spending slowing but not declining. The scenarios are described in the October edition of Ovum’s Straight Talk Monthly communication to clients. Researchers at Ovum say they aren't yet sure, but offer three possible scenarios. In the optimistic forecast, 2009 capex will be at the level of 2007, reflecting a slower 2008 spending pattern. capex could fall as much as 28 percent, a level somewhat consistent with the "nuclear winter" years after the Internet and telecom bubble just after the turn of the century. Cox Communications plans to launch mobile phone service in the second half of 2009, using Sprint network facilities. But Cox also owns its own spectrum and plans to build its own third-generation wireless network, although it also says it will test Long Term Evolution as an eventual 4G platform. Cox executives say the management and delivery of converged content is at the core of the company's wireless strategy. "Cox customers will be able to use their mobile phone to access television favorites, program their DVR, access content saved on their home computer and simplify their lives with enhanced voice features," the company says. A reasonable way forward would be for Cox to rely on Sprint for typical wireless voice, text messaging and mobile broadband services, while using its own network for applications more focused on content services related to what it currently delivers using its wired networks. All Cox phones will include a network address book that automatically synchronizes with home PCs, the company says. Cox also says that subscribers will be able to watch TV shows, and possibly full-time channels, on their handsets. The move into mobility is hardly unprecedented. Cox joined with Comcast and Tele-Communications Inc. as equity owners in Sprint PCS in 1994. Online video services have gotten positively mainstream over just the last six months, according to Ipsos MediaCT. The percentage of female Internet users ages 12 and older that have streamed a video online in the past 30 days has grown from 45 percent to 54 percent, an all-time high for this demographic and nearly equal to the percentage of men (58 percent) whom have recently streamed video content online. Moreover, the percentage of adults aged 35 to 54 that have recently streamed video online has also shot up since December 2007, rising from 49 percent to 60 percent in that time span. In the past, such behavior disproportionately was a younger male activity. In the third quarter this year, and for the year, eBay's Skype has posted numbers most companies would love to have. Use of Skype-out minutes increased 54 percent, which drove revenue growth of 46 percent for the quarter. Revenue over the past year came in at $ 521 million compared to $332 million for the comparable prior year, an annual revenue growth rate of 56.9 percent. Registered users increased 51 percent over the prior year and Skype-to-Skype minutes increased 63 percent to 16 billion minutes. Also, growth seems to be accelerating. Skype recently achieved its fastest growth rate of user activity in its history, by one measure, with an additional one million more concurrent users in just 35 days. Skype tends to measure usage by the numbe of concurrent sessions occurring. Skype saw 63 percent annual growth rate of minutes. Not so important, you might think, since lots of Skype usage is of the free sort. But use of paid minutes (2.2 billion SkypeOut minutes) increased 54 percent. Skype had third quarter 2008 revenue of $143 million and is on track to reach 2008 revenue of $570 million. In a sort of worst case scenario--if a global economic sluggishness decreases Skype use, about the opposite of what some of us think will happen--and Skype revenue growth slows, it should neverthless continue to grow annual revenue above the expected 2008 level (negative growth is hard to imagine). In a recent conversation with a financial analyst, the matter of Internet video bandwidth came up. The simple observation was that video consumes an order of magnitude (10 times) to two orders of magnitude (100 times) more bandwidth than voice does. The implication, of course, is that if online video consumption becomes popular, it represents a network engineering and challenge potentially 10 to 100 times more complicated than was the case for access networks built for voice. That isn't to say costs scale precisely that way, but it suggests the dimensions of the cost problem for any network services provider charged with adding that much bandwidth. The cost of deploying a fiber-to-the-cabinet (fiber to the neighborhood) network in the United Kingdom, for example, has been estimated at £5.1 billion. The cost of a fiber-to-the-home network is estimated at £28.8 billion, according to the Broadband Stakeholder Group. The immediate difference in potential bandwidth might not be an order of magnitude. 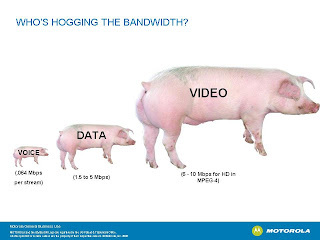 But the potential bandwidth difference ranges from an order of magnitude and up. halfway point faster than most other information and communication technologies, one easily can conclude. 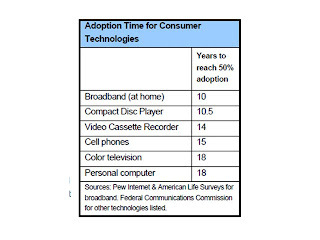 It took 18 years for the vpersonal computer to reach 50 percent of Americans, 18 years for color TV, 15 years for the cell phone, 14 years for the video cassette recorder, and 10.5 years for the compact disc player. It has taken about 10 years for broadband to reach 50 percent of adults in their homes. The point is that, looking historically at the matter, there is not now, nor has there actually been, a "broadband adoption problem." One can quibble about costs, the rate at which speeds are increasing, traffic shaping or business models. But as a simple historical model, broadband was adopted faster than any other popular mass market service, ever. Worldwide software-as-a-service revenue in the enterprise application markets is on pace to surpass $6.4 billion in 2008, a 27 per cent increase from 2007 revenue of $5.1 billion, according to Gartner, Inc. The market is expected to more than double with SaaS revenue reaching $14.8 billion in 2012. Gartner analysts say the adoption of SaaS is growing and evolving within the enterprise application markets as new entrants challenge incumbents, popularity increases, and interest for platform as a service grows, despite the challenging economic climate. The fastest-growing markets for SaaS are office suites and digital content creation, albeit from small bases, says Sharon Mertz, Gartner research director. Gartner estimates that the revenue attributed to SaaS within the office suites market will reach 99.2 per cent compound annual growth rate from 2007 through 2012, with a total SaaS revenue reaching $1.9 billion in 2012. By 2012, Gartner estimates that web-based freeware such as Google Apps, Adobe Buzzword, ThinkFree, Zoho and SaaS offerings will account for nine percent market share of total software revenue. Gartner forecasts 96.1 percent CAGR for SaaS revenue in the digital content creation segment from 2007 through 2012. “DCC software is becoming increasingly important as organisations evolve toward a more Web-centric business model," she says. The content, communications and collaboration markets remains the largest contributor to the overall SaaS enterprise application markets with revenue exceeding $2.1 billion in 2008, and it is expected to amount to $4.7 billion in 2012. SaaS will represent two percent to three percent of enterprise content management and more than 70 per cent of Web conferencing in 2007. The second largest contributor to the overall SaaS enterprise application markets is customer relationship management. In 2008, SaaS within the CRM industry is expected to exceed $1.7 billion in total software revenue. Gartner expects CRM SaaS revenue to exceed $3.2 billion in total software revenue in 2012. Net broadband subscriber adds, at least for U.S. cable and telephone providers, were much slower in the second and apparently third quarters of 2008. Part of that slowdown likely can be attributed to growing saturation of the broadband access market. But it also is likely there is some contributing pressure from general economic conditions as well. Dial-up users might just decide to hold off on a move to broadband for a little while. Cable TV marketers long have argued that multichannel video is a bigger and better value in tough times, representing a relatively-affordable source of entertainment for a family. An argument along those lines might help marketers of broadband access as well. "Product strategists responsible for the success of residential broadband services can continue to grow broadband penetration in a tough economic climate by positioning their service as a gateway to cheap content and communications," argues Sally M. Cohen, Forrester analyst. What typically happens in an economic downturn, in the area of communications or network-based entertainment services, is that people reduce consumption of some "enhanced" features while retaining the base service. In the cable TV segment, consumers tend to hand on their ad-supported services but skimp a bit on "premium" service. So you might see less use of fee-based video on demand, for example. Taking a look at mobile service, Forrester Research analyst Pete Nuthall says "the economic downturn won't put a dent in the European mobile penetration rate of 84 percent, but mobile services providers are feeling the impact of reduced usage and spending as consumers review their regular outgoings." That's confirmation that what has tended to happen in the past just might happen again. "The price of core services, voice and SMS, is of growing importance to more mobile users, while advanced handsets and services are becoming less important to fewer mobile users than a year ago," he notes. "Product strategy professionals are responding by de-emphasizing mobile data services and expanding the variety of SIM-only offers," he points out. Using the same sort of logic, it is conceivable that some broadband users will downgrade their service plans. And it isn't hard to imagine some users ditching landline service, at least for the moment, so long as they can afford a mobile calling plan that covers their typical usage. Blyk, a provider of ad-supported mobile services for 16 to 24 year olds is outsourcing its Netherlands and Belgium operations to Nokia Siemens Networks. Nokia Siements will provide prepaid charging, messaging systems and device management services for Blyk in those two countries, as a hosted service. The move is but one example of something we are seeing lots more of: service providers and carriers are outsourcing important network operations and facilities to third parties. eMarketer estimates that 63.4 percent of the U.S. population uses the Web at least once per month, and that nearly seven out of 10 Americans will do so by 2013. Some of us are shocked the numbers are that low. Once a month? It would be hard to overestimate the impact the Apple iPhone has had, as a business innovation, for AT&T, in ways that have nothing to do with device features, user interface or changes in user behavior. The iPhone seems to have a significant role in boosting AT&T's wireless market share, wireless data subscriptions, service upgrades, floor traffic, sales close rate and even sales of other smart phone devices and data plans. When AT&T launched the iPhone 3G on July 11th, it activated 2.4 million iPhone 3G units, 40 percent of them to customers who were new to AT&T. Perhaps somebody else knows the answer to this question, but I am not aware this ever has happened before: that a single device has lead to such a gain in market share in such a short time. It is possible, though unlikely, that some of these buyers were "first-time" mobile phone buyers. In all likelihood, however, virtually all these new buyers were defecting from another mobile provider. The iPhone 3G helped drive two million total net adds in the quarter, 1.7 million of them post-paid, making this the best retail post-paid net add quarter in our company’s history," according to AT&T Mobility and Consumer Markets CEO Ralph De La Vega. But AT&T executives long have expected a "halo effect." The thinking has been that some, perhaps many, prospects would be drawn in to look at the iPhone, but ultimately would choose another device. That indeed seems to have happened. Same-store traffic was up 15 percent versus the third quarter last year and two thirds of third quarter post-paid net adds chose integrated devices (smart phones with either a qwerty or touch-screen keyboard). More than 40 percent of customers upgrading their current plans purchased an Internet data plan for the first time, de la Vega says. 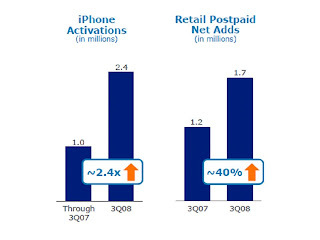 The net present value of a iPhone subscriber, is more than two times the NPV of AT&T's average post-paid subscriber. NPV is a way of accounting for total cash flows over time, discounted for the cost of borrowing or investment to create the cash flow. The percentage of post-paid subscribers who have an integrated device doubled over the past year to reach 22 percent of all devices in use. The number of 3G devices in the base also has grown dramatically from around seven million a year ago to more than 17 million at the end of the third quarter. The third quarter also was AT&T's best laptop connect quarter ever, and the company has more than doubled its 3G laptop connect base over the last year. AT&T now has nearly 5.9 million broadband speed laptop cards, dongles and integrated devices in service, though it does not break out the percentage of dongles and cards. 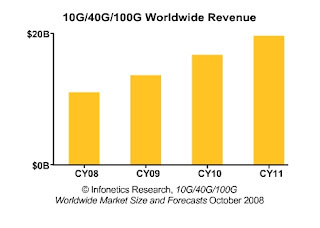 The 10 gigabit-per-second equipment market is big and growing fast, on target to hit nearly $9.5 billion worldwide in 2008, say researchers at Infonetics Research. At the same time, 40 G system sales are ramping rapidly, and 100 G should begin soon and take off by 2013, the company says. “A majority of service providers we've spoken to are expecting to invest in 40 G until the 100 G market is up and running; some providers are hoping to skip the 40 G phase altogether, but we don't see that being a viable option, as growing traffic demands are outstripping current capacities and 100 G won't reach reasonable price points until about 2012 or 2013," says Michael Howard, Infonetics co-founder and principal analyst. "When 100 G Ethernet arrives, it’ll be the next big thing and the most important, because it will last to at least 2025, solving traffic problems for a very long time," Howard says. rate of 59 percent from 2007 to 2011, Infonetics projects. The number of 10 G, 40 G, and 100 G ports shipping on enterprise and service provider equipment will jump from over one million in 2007 to 7.4 million in 2011, with 100 G making its small debut in 2009. AT&T added 148,000 net wired netwwork broadband access customers, up from the 46,000 AT&T added in the second quarter of 2008. That's a far cry from the 300,000+ quarterly net adds AT&T was putting up in 2007, but the broadband access market clearly is reaching saturation. Some of us had suggested that a shocking fall-off in broadband access net adds in the second quarter this year would be repeated in the third quarter. We'll have to wait to see reporting from Verizon and Qwest to confirm the thesis, but AT&T's results suggest marketing attention that had lapsed in the second quarter now has been sharpened. Wireline broadband subscribers, including both consumer and business customers, totaled 14.8 million, up 1.1 million over the past year. Perhaps the other notable story coming out of AT&T's third quarter report was the huge increase in wireless broad band net adds. Total broadband-capable connections in service increased 2.9 million in the third quarter to reach 20.7 million. a QWERTY or touchscreen keyboard. AT&T does not provide detail on the percentage of cards or dongles and broadband handsets. Telco and Satellite TV Subs "More Satisfied"
Cable television customers say they are less satisfied than customers of satellite and telco TV providers, according to Parks Associates. A new study by Parks Associates suggests, as other surveys have found, that subscribers to satellite television and telco IPTV are significantly more likely to be satisfied with their services than both basic cable and digital cable subscribers. Cable operators have struggled in selling the value of their services, Scherf said, and framing their services as an enhanced and convenient form of entertainment will be critical in reestablishing higher satisfaction. Video on demand initiatives, particularly those aimed at delivering a “Primetime, Anytime” experience, should be key elements in this effort. 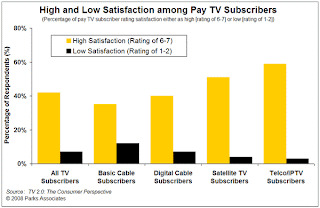 “Subscribers who actively use primetime VoD services show significantly higher satisfaction levels,” Scherf says. Proponents of mobile broadband have argued that 3G and other mobile broadband networks ultimately would make Wi-Fi networks largely unnecessary. While that is not yet completely true, it increasingly true. Mobile broadband now has pushed the mobile phone networks ahead of Wi-Fi hotspots as the most popular way of accessing the Internet on the move, in the United Kingdom, according to Point Topic. U.K. mobile phone companies have managed to grow their market share to 47 percent of users accessing the Internet away from home or work, compared to 42 percent who use Wi-Fi hotspots. A year earlier the ratio was 40:30 in favor of Wi-Fi, Point Topic says. Point Topic says 26 percent of those who use a mobile network to access the Internet are O2 customers. Orange and Vodafone each take about 20 percent of the market, while T-Mobile and 3 have 14 percent and 12 percent respectively. Vodafone is the leading provider of the dongle-user segment, with 24 percent share. of respondents. O2 comes in at 23 percent, followed by Orange, T-Mobile and 3, Point Topic says. Now this prediction I will find quite shocking, if it materializes: Forrester Research now estimates that use of Real Simple Syndication (RSS) might be nearing a peak of usage, among online marketers. 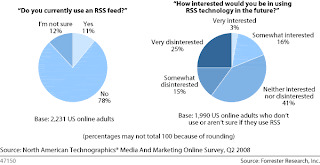 About half of marketers already have put RSS feeds on their Web sites. Keep in mind that RSS is used by about 11 percent of Web users, up from two percent in 2005, reports Steve Rubel at Micropersuasion. It might be one thing to forecast that RSS is a technology that is not going mainstream anytime soon. It is quite something else to predict it is nearing saturation. Forrester says a recent survey of marketers found that of the 89 percent of those who don't use feeds, only 17 percent say they're interested in using them. "Unless marketers make a move to hook them, and try to convert their apathetic counterparts, RSS will never be more than a niche technology," Forrester analyst Jeremiah Owyang suggests. Rubel himself does think RSS use by marketers has peaked. But then, I'm biased. I can't think of any development more important for many content businesses than RSS. Overall, peer-to-peer file sharing represents 43.5 percent of total North American consumer broadband consumption, while Web browsing represetns 27.3 percent and streaming contributes 14.8 percent of overall demand. But those statistics conceal something far more fundamental about P2P impact on access networks. In the upstream direction, P2P absolutely dominates. The three biggest traffic generators in the upstream direction are P2P at 75 percent of total load, tunneling at 9.9 percent and Web browsing at 9.1 percent. Entertainment, not productivity, is driving bandwidth consumption during the peak evening hours. 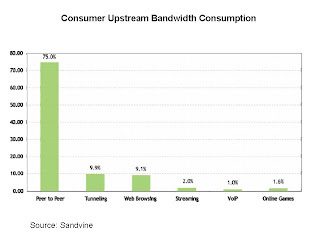 Web traffic and streaming videos account for 59 per cent of downstream bandwidth consumption as well, says Sandvine. The three biggest traffic generators in the downstream direction are P2P at 35.6 percent, Web browsing at 31.6 percent and streaming content at 17.9 percent. Over time, the proportion of P2P traffic might decline as a percentage of total, as more streaming services aimed at PCs and TVs take hold. Those services will add more demand primarily in the downstream direction. 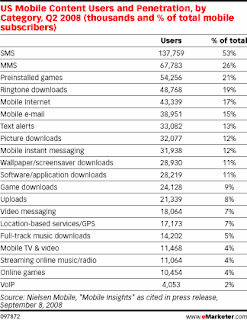 80% of Mobile Users Send Text Messages; or Do They? The amount of time users spend doing things on their mobile phones is increasing. About the only issue is by how much. About 54 percent of mobile users surveyed in September 2008 reported their usage had increased by more than 25 percent over the past two years. One-fifth of respondents estimated their usage had increased by 50 percent or more. One third of respondents talked on their mobile phone more than 10 hours per week, and 34 percent of respondents ages 17 and under talked for more than 15 hours weekly. Nearly four out of 10 mobile Internet users said they surfed the mobile Web for two or more hours every week. The key adjective there is "mobile Web" users. Other researchers have found that just about 16 percent of mobile users have the ability to access the Web from their mobiles. Some 62 percent of mobile users surveyed said they either already owned a smart phone or would own one within the next 12 months. Text messaging is nearly universal, with 80 percent of mobile users saying they use that feature and 29 percent of those who did spent more than two hours every week on the activity, says Azuki Systems. Researchers at Nielsen Mobile don't think so. They report just 53 percent text messaging usage during the second quarter of 2008. Vonage has Vonage has signed definitive agreements to refinance its convertible debt, a move that virtually everybody assumed was essential for Vonage to stay in business, and about which there has been doubt in some quarters. The financing package consists of a $130.3 million senior secured first lien credit facility, a $72.0 million senior secured second lien credit facility, and the sale of $18.0 million of senior secured third lien convertible notes. Vonage says it will use the net proceeds of the financing along with its own cash on hand to repurchase up to $253.5 million of the company's existing convertible notes in a tender offer commenced on July 30, 2008. Verizon Wireless has the lowest percentage of dropped calls among all major U.S. service providers, according to ChangeWave. Verizon subscribers report that, on average, just 2.7 percent of their calls were dropped over the past 90 days, nearly a percentage point better than AT&T (3.6 percent), their closest competitor. Sprint/Nextel (4.4 percent) and T-Mobile (4.5 percent) were third and fourth respectively. Importantly, one-in-five Verizon users (20 percent) say they didn't experience ANY dropped calls over the past three months, compared to 18 percent for T-Mobile, 17 percent for AT&T, and 10 percent for Sprint/Nextel. In addition, 43 percent of Verizon's customers in the survey say they're "very satisfied" with Verizon's service. The answer: both browsers made big strides, but Firefox still beats Chrome on one widely-used performance test, says Stephen Shankland. CNet writer. He found Chrome led the speed test with an overall score of 1,851 and Firefox in second place at 205. Running the same test on the latest developer version of Chrome, 0.3.154.3, boosted the browser's score to 2,265, a 22 percent increase. And Firefox jumped 15 percent to 235. Firefox 3.1 beta one, he says. Faster execution matters for a couple of reasons. At some point, the browser will become the client for executing any number of consumer and enterprise applications that are not stored on a local hard drive. Speed will matter. Also, users simply like faster-executing Web pages. Faster execution provides a higher end user experience. Some people think the global telecom industry is not lead by people capable of fundamental business model transformation. Nobody can say for sure whether that opinion is correct. What might be useful to reflect on, though, is the fact that the global already has managed several fundamental shifts in its revenue. 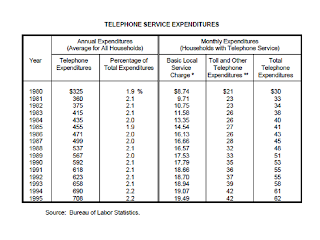 In 1995, for example, U.S. telcos earned about $19.49 a month selling consumers basic dial tone. But telcos earned $42 a month selling enhanced services and long distance. In other words, 68 percent of consumer revenue was generated not from the basic dial-tone product but from other services and applications. For an industry generally considered at that time to be an "access lines" business, the appellation already was inaccurate. In 1997, nearly half of all local telco revenue came from long distance alone. By 2007, long distance represented just 18 percent of total revenue. So a business once based on "lines" then became a business based on long distance and enhanced services, only to be replaced by a business where half of all revenue was generated from wireless services. Also, consider that over the last decade we have seen the broadband access business grow from single digits to "near saturation" levels. The point is that business model transformations have happened several times in industry history, sucessfully. The next transformation likely will involve wholesale and business partner services of various types, augmented by content services. One can argue telco executives can't make this next change, even if they have transformed themselves before. I would not bet on that. Life throws curve balls. Patriots don't get the perfect season. Red Sox come from behind to keep their title hopes alive. It happens. 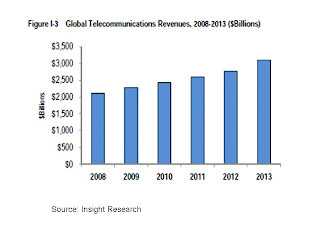 Roughly half of all business and consumer communications spending goes to wireless services. But there appear to be relatively-distinct niches within the enterprise mobile user base. The "information worker" segment, including sales, information technology and managers use real-time data, email, calendar and portal accessed applications, say reserachers at Forrester Research. There are lots of devices used and IT staff tends to have limited control over them. "Task workers" such as supply chain personnel, medical personnel, manufacturers and others using line-of-business applications on a single device such as inventory scanners, data entry tablets. IT tends to have significant control over the limited range of supported devices. But there is an emerging demand from "wannabes," including just about any worker not represented in one of the two other segments. Wannabees likely will use a wide range of devices for email, calendar, product information management and basic portal access, for work and personal uses. IT will have to support a wide range of devices and will have limited control over them, Forrester argues. 48 percent check email and 42 percent acess the Internet or a company Intranet for work related information. Some 35 percent of users say they use their smart phones "only for personal purposes." Keep in mind that nearly seven out of 10 enterprise mobility users pay for their own service. At the moment, 69 percent of employees pay for their voice service, while 23 percent have mobile paid for by the employer, Forrester says. About eight percent of workers cost share with their employers. About 59 percent of employees pay for their own mobile data services. About 34 percent have their mobile data service paid for by their employers. About seven percent of workers have a cost share agreement with their employer. What Does AT&T Do For An Encore? Executives at AT&T have to be spending time thinking about what to do when the Apple iPhone ceases to be an AT&T-only product. In October 2006, before potential customers were aware that AT&T would have exclusive rights to market the iPhone, Verizon Wireless was getting twice as much upside from "churners" as AT&T was. About 28 percent of poll respondents surveyed by ChangeWave indicated they would be switching to Verizon for mobile service. About 14 percent indicated they would be switching to AT&T. After the deal was announced, the churn gap closed. And AT&T has had a net advantage in customer switching behavior since very-early 2008. Many would say this is an "iPhone effect." Some might argue it also is the result of other activities, including AT&T promotional activity. We won't really know until the iPhone exclusivity deal ends. In the meantime, AT&T marketing staffs have to be working on the next game-changer. Sylantro Systems has announced compatibility of its Synergy platform with the Amazon Web Services’ Elastic Compute Cloud (EC2). By doing so, Sylantro makes its voice and Web applications available in a cloud computing environment. Amazon EC2 from Amazon Web Services is a Web service providing hosted, resizable compute capacity on a pay-as-you-go basis. It is designed to make Web-scale computing easier and cheaper. So look at it this way: applications developed for Web delivery, using the Amazon infrastructure, now can be configured to work with Sylantro calling and communication features. In principle, this allows more applications or services to provide a range of communication features one normally would expect from a business phone system. Service providers can use the capability to test demand for services provided on a hosted basis, especially on a "sample this" basis, or as a way to provide hosted business or consumer communications services with a disaster recovery angle. SureWest Communications has expanded television, Internet and telephone service to some 3,500 Kansas City area homes and remains on track to reach 10,000 by the end of the year. In the broadband services area, SureWest customers and prospects have something like an embarassment of riches, though some will argue the prices are too high. Customers can buy 20-megabits-per-second connections for about $92 when purchased as part of a bundle, and can get 50 Mbps service for about $192 when when bundled with one other service. Business customers can buy 100 Mbps service. So the issue, at least where SureWest operates, is demand, not supply. The argument can, and probably will be made, that prices for the higher bandwidths are too high. Observers should keep in mind that commercial prices for T1 lines offering 1.544 Mbps service cost as much as the 50 Mbps service, if not more. Perhaps that will not be enough to sway some opinion on the pricing front. But in this case, at least, broadband supply is not a problem. Demand is the issue. One can argue that prices should be lower. It is harder to argue that SureWest's ability to remain in business requires that level of prices at its forecast penetration levels. If SureWest does a lot better than it now forecasts, lower prices are possible. But this now is a demand generation exercise. Some 16 percent of Internet users live a “hyperconnected” life, meaning they regularly use more than seven devices and more than nine applications, says Scott Wickware, Nortel general manager. Some 36 percent are “increasingly connected,” meaning they use four devices and nine applications, he adds. About 20 percent are passive online users and 28 percent are "not very connected," he says. So although about half of Internet users might not agree they are living in "a hyperconnected world” that requires or benefits from mobile broadband access, Wickware suggests 52 percent are candidates for mobile broadband. The logic is simple enough: as users got comfortable with email and then wanted to have email available in their pockets and purses, so they increasingly will want access to their social networks, video and audio entertainment in the same way. As voice once was a service delivered to "places" and now is delivered to "people," so email used to be delivered to "PCs" and now is delivered to mobiles. Roughly the same process will unfold with broadband as well, most argue. Where broadband used to be delivered to a place, it increasingly will be delivered to people; where applications are used on PCs, they in the future will be used by people on a number of mobile devices in their purses and pockets. Granted, everybody is looking in the rear-view mirror, but Gartner analysts now expect an information technology spending increase of 2.3 percent in 2009, revised down from the original expectation of 5.8 percent, according to Peter Sondergaard, Gartner SVP. Give it a quarter, though. October's impact might not yet be so clear. Entrepreneurs are not worried enough about herding their start-ups through a rough patch, Rafe Needleman, CNET News writer says. A recent survey of 491 respondents found that 30 percent reported having two or more years of money in the bank, or are cash-flow positive. About 21 percent say they have a year's worth of cash set aside. About 49 percent reported having only three or six months of cash. That suggests as many as 50 percent of firms will be in serious trouble if an economic slowdown lasts more than a year. Also, only 33 percent of the 524 respondents say they are "worrying about revenue and payroll." Granted, the slowdown does not to some of us appear to be a "nuclear winter," though one could get a huge argument going on that score. Still, when young companies cannot raise the next round of funding, they die. Hence the importance of cash on hand. A recent survey conducted by Nielsen Mobile suggests wireless-only households now have reached about 17 percent penetration nationwide, and could well hit 20 percent penetration by the end of the year. But Nielsen also found something else: 10 percent of U.S. households with landline phone service in the second quarter 2008 were previously wireless-only users, and had chosen to buy wired voice service again. That is important for obvious reasons. Just as some users find wireless-only service to be attractive, 10 percent of users also have found wireless-only service to be unsatisfactory. The issue is “why?” When we look at the landline tenure of these former wireless-only users, approximately one percent of wireless-only users may return in any given quarter, Nielsen Mobile says. As it turns out, mobile coverage is sometimes perceived to be insufficient for would-be or former wireless-only users. Dropped calls and poor audio quality are reasons wireless-only users decide a landline service still makes sense. For some of us who were part of companies that cratered during the Internet bubble burst starting in 2001, past truly is prologue. Some companies will discover "zero" is their present valuation. Others will be gobbled up by the elephants in the room. Larger, better-capitalized firms are going to find attractive assets to buy, and buy them. Media companies will move relatively early, even telcos might find it is the right time to "move up the stack" from layers one and two to the application layer, in broader ways. Remember the last sea change? All of a sudden, "eyeballs" (reach) largely ceased to matter. Revenue did matter. But firms that already have scale and revenue might be able to reposition acquired assets that primarily represent "reach," and convert reach into revenue. In the start-up business, 80 percent failure rates are the norm. All that will happen now is that failure rates will accelerate, as firms find they cannot get the next financing round. But the elephants will be dancing. Given that consumer spending has been generally sluggish all year, even before the recent liquidity crisis, it shouldn't be surprising that some discretionary purchases are showing sluggishness as well. Mid-summer research by Changewave Alliance, for example, has been showing slowing consumption of downloaded media. Compared to a year ago, ChangeWave's latest survey of 2,248 consumers shows entertainment downloading has actually slowed. Where in July 2007 about 48 percent of respondents reported downloading songs, in July 2008 just 43 percent said they currently were downloading songs. Likewise, where 14 percent of respondents in July 2007 reported downloading movies, just 11 percent said they had done so in July 2008. The same declines were seen in TV show downloading, computer games downloads, music or book downloads as well. Moreover, the percentage of our respondents saying they do not download entertainment has risen to 41 percent, about six points higher than in 2007. This sort of behavior might be likened to what one typically sees in times of economic stringency: people downgrade some forms of discretionary entertainment spending. People do not tend to disconnec their cable or wireless services. But they might downgrade a service package to eliminate premium channels like HBO or Showtime. Downloads of songs, movies or TV shows fall into that category. One can simply download fewer titles to save a little money, while keeping the basic subscription services (broadband stays, but fewer items are purchased). In recent tests conducted by Computerworld, Sprint's 4G Xohm network showed latency performance far superior to the AT&T "Broadband Connect" 3G network, with higher throughput as well. Where downloads ran at about 1.3 Mbps to 1.7 Mbps for Broadband Connect and 3.4 Mbps to 4.4 Mbps for Xohm, the more-important statistic might have been the latency figures. Where the AT&T 3G network had a "ping" response of about 234 milliseconds, the 4G Xohm network had 97 millisecond pings. In layman's terms, Xohm-delivered applications responded faster to user requests. Low-latency performance--sometimes described as latency performance identical to a traditional wired network--has been a key design goal for the Xohm network, and has been deemed important for support of real-time applications. Whether one looks at how average consumers “compute,” or how industry segments “compete,” it now appears that cloud computing is poised to change the ways users interact with each other, use applications, communicate and compute. Some of the changes are obvious; others only now developing. Conceptually, there are several ways cloud computing already is used. Applications in the cloud is what almost everyone already has used in the form of Gmail, Yahoo mail, wordpress.com, Google apps, search engines, Wikipedia or virtually any Web-executable application. Platforms in the cloud are used virtually exclusively by software developers and their clients. Developers write their applications to a open specification and then upload their code into the cloud where the app is run remotely. Infrastructure in the cloud takes the software development process a step further. Developers use remote, network-based compute, storage, queueing, and other resources to create and run their applications. “Cloud computing” sometimes is likened to grid or distributed computing, utility computing (computing as a service), software as a service, network computing, Internet-based applications, autonomic computing, peer-to-peer computing or remote processing. It typically is some combination of those things. And as much attention as cloud computing gets in the enterprise information technology space, it already is making serious inroads in the consumer space. Some 69 percent of online Americans use Web mail services, store data online, or use software programs such as word processing applications whose functionality is located on the Web, say researchers at the Pew Internet & American Life Project. They are, in other words, already users of “cloud computing,” an emerging topic in the enterprise computing space as well. Some 56 percent of respondents say they have used a Web mail service such as Hotmail, Gmail, or Yahoo. About 34 percent say they have stored photos online. Some 29 percent say they have used online applications such as Google Docs or Adobe Photoshop Express, as well. About seven percent say they store personal videos online, while five percent say they have a for-fee online storage service and another five percent say they use an online backup service. About 51 percent of Internet users who have done a cloud computing activity say a major reason they do this is that it is easy and convenient. Some 41 percent of cloud users say a major reason they use these applications is that they like being able to access their data from whatever computer they are using, Pew researchers say. Some 39 percent cite the ease of sharing information as a major reason they use applications hosted in the cloud, or store their data remotely. As you might expect, users with mobile computer access are more likely to have done these activities. Among the 34 percent of online users who have used a WiFi connection on their laptop to go online, 79 percent have used at least one cloud computing activity above, and 52 percent have used at least two. Warner Bros. Entertainment recently decided to release movies online before releasing them on DVD, at least in South Korea. This reverses the long-established Hollywood distribution model and may open the door to a major increase in movie downloads. Why in South Korea? Film piracy. Moving the more secure online system earlier in the release window is viewed as a way to keep pirated content out of the public domain a bit longer. But researchers at MultiMedia Intelligence see the Warner Bros. initiative in Korea as being the start of a trend in implementing early release window content online. Already television studios are experimenting with online distribution windows that precede TV broadcast or DVD release windows. Make no mistake: it's all about the money. When content owners think they can make more money by giving online distribution a higher priority, they will do so. Today it is the DVD market which provides the highest profit and gross revenue, but not many expect that to remain the case forever. Enterprise information technology managers are badly underestimating the future demand for mobility devices and services in the enterprise arena, overlooking a new emerging class of mobile workers that rely on smart phones, where the traditional demand has been provided by traveling workers. On-the-road executives or managers, telecommuters or field service employees currently represent 20 percent of the workforce, says Forrester analyst Michele Pelino. Call the workers driving the demand "mobile wannabes," if you like. Already, nearly a third of smart phone users expense all or some of their monthly bills for wireless voice services to their employers, while 40 percent expense the cost of their wireless data access to their company. Forrester Research estimates that by 2012, 73 percent of the workforce will be considered mobile. This new class of workers represents just six percent of the present workforce, but Forrester estimates that they will grow to 25 percent of workers within the next four years. In fact, Forrester estimates 73 percent of the workforce will be considered some sort of mobile worker by 2012. Mobile wannabes include executive assistants, human resource workers and finance department employees who are generally at their desks most of the day but use smart phones to access email and other corporate applications while commuting to work or while away from their desks. Millennials, workers younger than 30 years of age also expect mobile support. Most of this growing group of users buy their own devices, so the trick is to create new service plans that are affordable enough to encourage broader use of mobile data services, Forrester says. What percentage of the online iPhone researchers on AT&T's site were looking at other mobile devices in July and August? Quite a few, say reserarchers at Compete. Sprint's Samsung Instinct seems to have been the iPhone's best competition so far, Compete says. About five percent of visitors checking out the iPhone also checked out the Instinct. 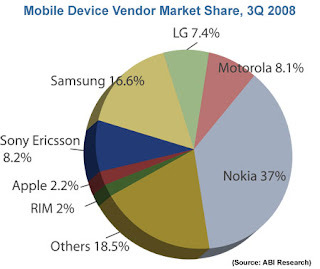 In both July and August, it was the alternative most viewed by iPhone 3G researchers. The AT&T Tilt and the LG Dare were viewed by more iPhone 3G researchers in August than they were in Julyn Compete says, getting three to four percent of iPhone investigators to take a look. But the big question is, what makes a good iPhone alternative? So far, the touchscreen seems to be a key factor – the Instinct, Dare, and VU all have one – but there's clearly more to the appeal to the iPhone than that, Compete argues. Nokia is answering the integration of music with the iPhone (via iTunes) with the "Comes with Music" feature. The G1, offered by T-Mobile and featuring Android also should be a factor at some point, as should the new line of touch screen BlackBerrys, Compete argues. Google might be able to leverrage its open apps environment, while enterprise users hungry for a touch screen interface on their BlackBerries will drive adoption of those new devices. The point is that Apple's iPhone has recast the device market. Effective November 1, 2008, Verizon Wireless is assessing a transaction fee of $0.03 for every commercial text message (terminated on a moble handset). The new rules do not apply to people sending text messages to each other, but rather to content firms that today pay fees to send or receive commercial text messages of one sort or another. The new fees also do not apply to text message applications, even if commercially-based, if they are free to the end user or are sent or received by non-profit entities. Interactive voting and text search or text alert applications most likely are covered by the new fees. Current commercial text messaging fees are said to cost the commercial sender anywhere from a fraction of a penny to a few cents, so the plan will have huge impact on use of such commercial text messaging apps. Predictably, commercial users will cry "foul." Perhaps Verizon should have, or still can, scale the increases in a more-gradual way, allowing their commercial customers time to adjust. In principle, though, we ought to expect similar sorts of moves on a rather broad range of fronts as broadband and mobile providers try to create new revenue models that involve some sort of revenue sharing between content providers and the carriers themselves. Commercial customers have sound financial reasons for objecting to the practice: free or cheap distribution is a better cost model for content providers than having to share revenue or pay fees for any number of conceivable services an ISP or access provider might provide. What is not contestable is that if the global service provider industry is in the midst of a fundamental business model evolution--where voice revenues in fact continue to decline as the industry revenue mainstay--then other revenue sources must be developed to replace virtually all of the lost voice revenue and margin. The actual cost of creating and operating a text message infrastructure is not the issue: lots of products are priced at retail in a way that is not strictly related to the cost of providing them. Sales and loss leaders are widespread retail practices, and products run a gamut: some are low-margin or negative margin, others are modest margin products and some are high-margin products. Production cost is only part of the retail price equation. The Verizon move is indicative of the seriousness of the revenue transformation. Voice is going away as the foundational revenue driver and must be replaced. Service providers have no choice in the matter. Content providers won't like the change. But these and similar moves in other parts of the business are inevitable. If the future of communications network revenues cannot be based on voice or simple broadband, it must be based on something else. And if more content begins to be delivered using broadband networks of all sorts, some revenue-sharing model, where service providers are part of the revenue chain, must be created. That doesn't mean content providers have to like the change. But in the absence of meaningful ways to sustain the networks on voice or broadband access revenues, service providers do not have a choice. So look for more "channel conflict" in the years to come. It is inevitable. Mobile providers in the Phillippines say they will have to raise text messaging prices if the government seizes half of text messaging revenues to fund new health and education initiatives in the country. Under the proposed plan, the government will claim13.5 centavos of the 27 centavos currently charged. At the end of the day, consumers always bear the burden of all taxes, fees and charges. Businesses simply collect those fees and forward them to government agencies. What else would any manager do, given the need to make a profit margin of "X," on a cost structure of Y, when it is clear a cost structure now is "Y+N?" Rogers Communications seems to be dropping support for a low-speed wireless broadband service, Broadband Reports says. Apparently Rogers has discontinued its "Portable Internet Basic" tier. That plan, costing $24.95 a month, supplied 256kbps downstream and 64 kbps upstream. The "Rogers Portable Internet High Speed" costs $49.95 a month and supplies 1.5 Mbps downstream and 256 kbps upstream. Both services have a 30 GByte monthly usage cap. Rogers apparently now wants to offer just a single tier of service, the 1.5Mbps version, though they've lowered the price to $44.95. At least some users will complain about the inability to buy the lower-speed tier. Personally, I think it is odd to offer a 256 kbps "broadband" tier in the first place, though Rogers might have considered a tier offering more bandwidth than 256 kbps and less than 1.5 Mbps. Need more evidence that the historic demarcation between wide area networks and premises networks is gone? Verizon Communications has launched an "Expert Care" service plans that offer 24 by 7, in-depth technical support for computer software and hardware problems, as well as repair or replacement coverage for computers, TVs and telephone equipment. Expert Care offers three types of service plans providing consumers a wide range of choices in coverage and support for low monthly or one-time fees that can be added to consumers' Verizon bills. The plans include device repair and replacement of multiple computers, TVs and telephones regardless of age, size or place of purchase. The plans range from $4.99 to $19.99 a month, depending on the equipment covered, and may also include repair or replacement of original equipment remote controls, keyboards, mice, monitors and backup batteries for Verizon's FiOS service. A premium technical support plan, priced at $14.99 a month, includes telephone and online support for issues such as virus and spyware detection and removal, virtual private network problems, help with firewalls, problems with computer operating systems, gaming connectivity problems, and software and hardware help. Telephone and online technical support is available 24 hours a day, seven days a week. Premium on-site support also is available, with the work provided in partnership with Circuit City's Firedog tech support operation. This plan includes on-site support ranging from operating system installations to full PC and home network setups, billed on a per-use basis. There are several offerings, tailored to specific needs and priced from $99.99 to $249.99. AT&T also offers similar support for premises networks, equipment and software. The point is that the neat distinction between what "network service providers" do, and what value-added resellers, system integrators, interconnects or audio-video specialists do, is eroding. With the advent of Internet Protocol services, it is necessary to support end user devices and applications to ensure proper functioning of applications and services. You have to start somewhere: Sprint's "Xohm" business recently unveiled a number of co-marketing agreements with Lenovo and Acer that will have each of the PC vendors introducing a number of notebooks for enterprise and small business buyers. The ultimate goal, of course, is to have WiMAX capability embedded in new classes of devices such as cameras or MP-3 players. For the moment, though, Xohm seems to be positioning as a "metro-wide Wi-Fi" experience. That means making it marginally easier for mobile PC users to buy what others might consider a "mobile broadband access" experience using dongles or PC cards. Xohm promises more bandwidth of course, and that is the key distinction for the moment, aside from the ability to buy service at lower prices and without contracts. Users who are mobile in many cities across the United States will have to make judgments about where they actually need wireless broadband access and whether Xohm will have coverage in those locations. Where Xohm is today is not where it would like to be in the future, of course, but for the moment it will have to rely on lower pricing and higher bandwidth as the differentiator with existing 3G mobile broadband offered by Sprint, Verizon and AT&T. In due course, more unusual options should be available, and the issues with nationwide roaming should clear up. Still, it must be said: as a user of mobile broadband service who is mobile beyond a single metro area, coverage trumps bandwidth or price. Lower prices are nice and higher speeds ultimately will be important. But coverage is king if one has to roam on a continental basis. Not every use case has that requirement, though. Users who will not require roaming outside their home city will find $45 per month for a Xohm service, without a contract, and featuring 2 Mbps to 4 Mbps throughput, more attractive than $65 a month for 1 Mbps or less and a two-year contract. The issue is what percentage of the mobile PC access market is in the "national roaming" compared to the "metro roaming" category. I have used "metro" roaming broadband access, and it is useful as an alternative to Wi-Fi hot spots. It does not fare well when the use case is national roaming, though. Lenovo plans to offer five ThinkPad laptops with WiMax, while Acer will roll out two Aspire notebooks for small businesses that have the WiMax technology. The Lenovo ThinkPad notebooks that offer Intel’s Centrino 2 platform with the optional WiMax technology include the new ThinkPad X301 as well as the ThinkPad W500, W700, SL400 and X200. A consumer notebook, the Lenovo IdeaPad Y530 laptop, is expected to follow later in 2008. In addition to Lenovo, Acer is also preparing to roll out two notebooks – the Aspire 4930-6862 and the Aspire 6930-6771 – that offer the updated Intel Centrino 2 platform and the WiMax feature. While the Acer Aspire series is geared more toward consumers, these notebooks have found a place within the small business market. The point is that one cannot yet assess how well WiMAX will fare in its intended markets. The footprint remains limited and device support is limited as well. But one has to start somewhere. Comcast says it will have 20 percent of its markets upgraded with faster DOCSIS 3.0 50 Mbps speeds by the end of the year, and all customers will be upgraded by the end of 2010. Which will provide an interesting test of end user demand. Other service providers who provide speeds that fast have been reluctant in the extreme to say anything in public about take rates for services offering that sort of speed. I think the clear implication is that really-fast broadband remains a bit of a niche. In Minneapolis/St. Paul users can buy a 50 Mbps downstream/5 Mbps upstream connection for $150 per month. What isn't so clear is how many customers are willing to do so. What would seem obvious is that a good percentage of the potential market at this point is buyers who have some business justification for such bandwidth, either to support a home-based business or work-at-home operations with a fairly high video conferencing requirement. Verizon's 20 Mbps FiOS offering costs $52.99 a month when bundled with a Verizon phone service and $57.99 a month without, so that roughly sets expectations for market pricing. Verizon's 50 Mbps downstream, 20 Mbps upstream service costs $139.95 a month with phone service and $144.95 a month without a bundled phone line. That is worth keeping in mind as nominal speeds keep climbing. So far, it appears uptake for the highest-end offerings is relatively modest, whatever it may be worth as a marketing platform. What observers always seem to miss about the mass market is its price sensitivity. Consumers can become accustomed to services and features that once seemed to be luxuries--broadband access, cable TV, multiple PCs in a home and mobile service being prime examples. But it takes time for the value to be understood and the pricing to become acceptable for the value received. By some estimates it has taken the better part of a decade for the Internet access habit to be created and then to be recast as a "broadband" Internet access "need." It might take a similar amount of time before 50 Mbps access tiers are seen as the "typical" way to satisfy the access need. People don't generally buy "technology'; they buy value. It will take some time to convince most people that 50 Mbps for such prices are valuable enough to pay for them. The latest ChangeWave consumer survey, conducted in late September 2008, shows another major leg downward for U.S. consumer spending. At the same time, confidence in the economy has dropped to exceptionally low levels and looks to stay that way for three months, ChangeWave says. Of course, consumer spending has been trending lower for about 15 months. More than half of 4,067 respondents (52 percent) now say they'll spend less money over the next 90 days, for example. About 18 percent say they'll spend more. More respondents say they are spending less because they are paying down debt (29 percent) or saving more (26 percent). Generally higher prices and higher energy costs get top blame for reduced spending. Liquidity Impact on Service Providers? Just about the only thing most people seemed to want to talk about, at some meetings during the recent Comptel convention, heavy with providers of wholesale communications capacity and retail service providers, was the possible impact of the banking crisis on the telecom business. It's a fair enough question. For the most part, it is not good news. In a capital-intensive business, capital stringency is never a good thing. Some acquisitions will not happen, which means some asset sellers and buyers will be unhappy. Embarq, the fourth-largest U.S. phone company, has been trying to sell itself for weeks, the Wall Street Journal reports. But those plans are tabled for now because potential partners haven't been able to raise capital for a deal. That probably is going to be an issue for any would-be buyers of Nextel as well. Some network expansions will be put on hold, while others will be slowed, the reason being that available cash has to be funneled to operations, debt service, dividend payments and other uses when borrowing and credit are not easy options. On the retail side of the market, one would have to expect some organizations will delay planned purchases of new phone or other premises equipment, delay opening new branches or take other "headcount-related" moves that typically spur the purchase of new communications services and equipment. There are, for example, some indications that wireless "phone replacement" services offered by MetroPCS and Cricket Communications gained ground in the third quarter of 2008. MetroPCS Communications "pre-announced" an 82 percent rise in third quarter 2008 profit on a 41 percent increase in total revenue. The company added 249,000 net subscribers in the third quarter, a development MetroPCS believes shows it is benefiting from customers cutting their land lines. Executives at firms supplying bandwidth products say it will be a quarter or two before it is possible to assess any economy-related impact on Ethernet or bandwidth products. 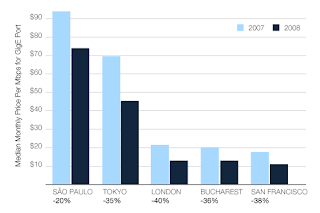 Some particular markets, such as New York City, might see a drop-off from financial sector customers, for example. On the other hand, providers of core IP bandwidth should see a largely neutral environment as far as aggregate demand, though there could be some pricing pressure, as broadband mobile services and consumption of video continue to grow. Nobody is buying capacity "on spec," and nobody has done so since perhaps 2001, so there is not much potential damage on that front. The fundamental price-per-megabit trends seem intact, and consumption of bandwidth likewise seems still to be in line with recent years. Capacity providers, unlike most in the business, are used to steady, relatively predictable price declines and demand growth of roughly 60 percent a year. And then there are the inevitable winners: companies that can tap credit to remove competitors from the market, grow service footprints and product lines, acquire human and other resources they might not have been able to afford recently. So far, though, there is little firm evidence one way or the other about the potential impact of the liquidity problem. 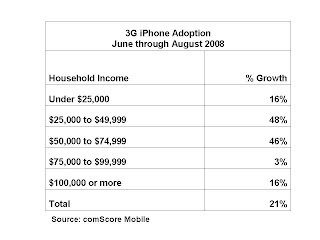 About 30 percent of U.S. consumers who purchased Apple’s new iPhone 3G from June through August 2008 switched from other mobile carriers to join AT&T, a new study by NPD Group finds. About 23 percent of consumers, on average, switched carriers between June and August 2008. By some measures, then, AT&T got a seven-percent share boost from the iPhone. Nearly half (47 percent) of new AT&T iPhone customers that switched carriers switched from Verizon Wireless, another 24 percent switched from T-Mobile, and 19 percent switched from Sprint. Before the launch of the iPhone 3G, iPhone sales represented 11 percent of the consumer market for smart phones (January through May 2008); however, after the launch of iPhone 3G, Apple commanded 17 percent of the smartphone market (January through August 2008). The average price of a subsidized smart phone sold between June and August 2008 was $174, down 26 percent from $236 during the same period last year. Verizon Communications has lost its VoIP patent infringement case against Cox Communications Inc, the Wall Street Journal reports. Verizon filed papers in Eastern District Court of Virginia on Jan. 11, 2008 alleging that Cox violated eight patents related to the technology used for completing IP voice calls. The lawsuit came after Verizon had successfully argued that Vonage was infringing its patents. Verizon included in the lawsuit claims of infringement of four patents Vonage was found to have violated in an earlier case. Verizon was awarded $120 million in damages in that case. But the jury in the Eastern District of Virginia ruled that Cox Communications did not infringe on six Verizon patents. In addtion to Cox Communications, other leading cable operators perhaps most relieved of all, as it might be hard to defend the notion that any of the leading cable providers were innocent, had Cox been found to be infringing. But other indpendent VoIP providers also have to be breathing a little easier as well. Had Cox been found to be infringing, it isn't so clear how any other cable company might have escaped litigation, cable or independent VoIP providers alike. Verizon apparently has recently reached a deal with Comcast in which both companies agreed not to sue each other over patent issues for five years. A Verizon lawsuit against Charter Communications for VoIP patent infringement is still pending. Netflix says its third quarter revenue and earnings per share will fall within prior guidance but that subscriber numbers will fall “just below” the low end of guidance. “Net subscriber growth in July was in line with expectations but August was unusually weak”, says CFO Barry McCarthy. There could be lots of reasons for a single-month slowdown. It is possible potential new subscribers were distracted by the Olympics or the Presidential election. But some quickly will jump to the conclusion that economic stringency is pinching Netflix the way some expect a sluggish performance for premium cable channels or perhaps video on demand. Median monthly IP transit prices for 1,000 Mbps Gigabit Ethernet (GigE) ports in major U.S. and European cities ranged from $10 to $14 per Mbps in the second quarter of 2008, report researchers at TeleGeography. IP transit prices in Asia remain far higher than in the United States and Europe, which explains the surge in undersea cable construction across the Pacific Ocean. Nearly half (46%) of those who use social networks have also visited a social network through a mobile phone, according to ABI Research. Of these, nearly 70% have visited MySpace and another 67% had visited Facebook. No other social networking site reached 15% adoption mobile adoption. That is what one would expect if the Pareto Principle (80/20 rule or "long tail") holds. "As in the online social networking space, there is clearly a large gap between the big two (MySpace and Facebook) social networks and the others," says research director Michael Wolf. "ABI Research believes this is because consumers do not want to recreate entirely new and separate social networks for mobile, but rather want to tap into their existing social network and have it go with them via the mobile phone. For most, this means MySpace, Facebook, or even both." The biggest features consumers use when accessing a social network on their phone is checking for comments and messages from their friends, with both of these features registering above 50% for mobile social network users. Posting status updates also has proven popular, with over 45% of mobile social users letting others what they are up to via their phone. "The social network is increasingly becoming a central hub for communication across online and mobile domains for many consumers," says Wolf. "To a degree, it allows them to centralize messaging, communication and even digital media consumption through a centralized property on various screens." That is something enterprise social networks might hope to replicate. Local Loop Not a Natural Monopoly?